David Allred’s pen was a Kickstarter first for me. While the majority of Kickstarter projects come in weeks or even months later than originally projected, David’s pen arrived EARLY…significantly early. Though I wasn’t expecting to receive my pen until January 2013, it surprisingly arrived on November 23rd, 2012. Wow! 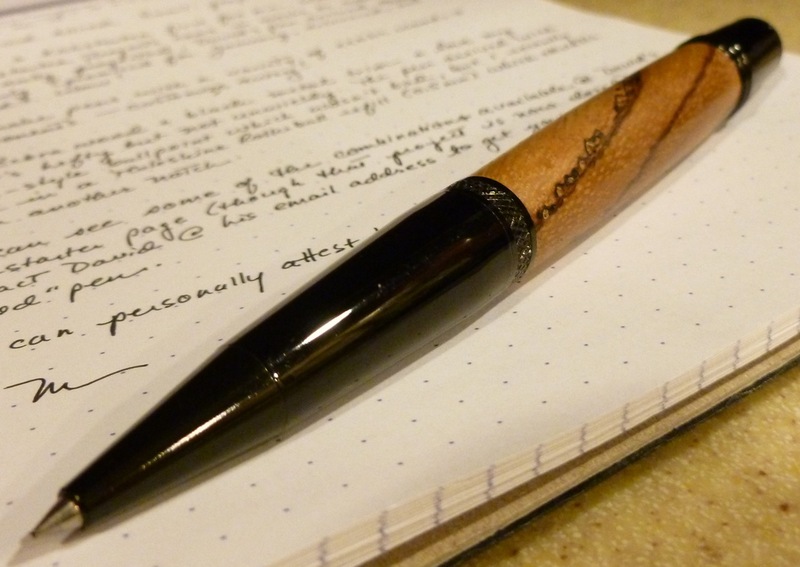 Though David’s Kickstarter project has closed, you can read about his pens here. In short, he can create pens with a variety of exotic wood (desert iron wood, padauk, purple heart, cocobolo, goldfield burl, etc.) and metal components. The hardest part is picking a wood/metal combination because there are so many intriguing options. All pens are twist-style and take Parker-style refills. After much hemming and hawing, I chose Zebra wood and the black metal trim. (David calls this “gunmetal,” which is different than my idea of gunmetal, but I settled on this choice after a few back-and-forth emails with him to clarify the various color options.) The pen is hefty, but not unwieldy, and is very well-balanced. It arrived with a Parker-style ballpoint refill, which wasn’t bad, but I recently swapped in a Moleskine rollerball 0.5mm refill, which, I think, elevates the pen yet another notch. You can see a sample of the wood/metal combinations available on David’s Kickstarter page. 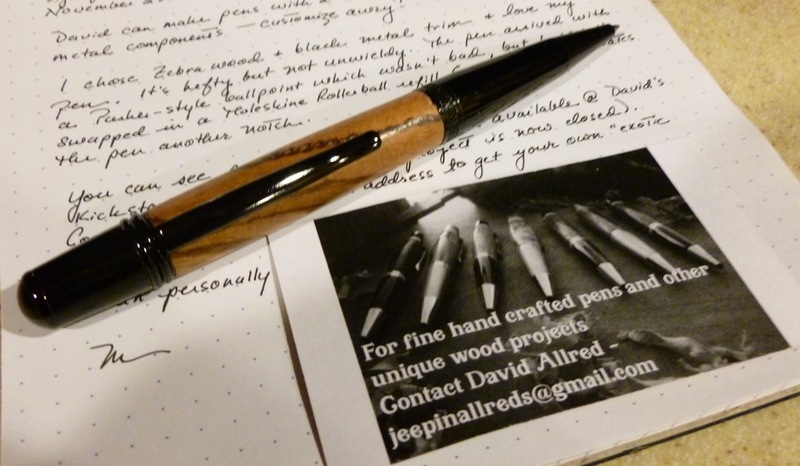 And though, as I’ve said, his project is now closed, I encourage you to contact David if you’re interested in getting your own “exotic wood” pen. I can personally attest to his impressive workmanship and work ethic.